I refer to Sophie Kinsella's books as "candy books" because like candy they are delicious, go down easily, and make me feel guilty for consuming them. (I know I don't need the empty calories.) Candy books are different from chocolate books, which are my favorite books that taste amazing and decadent and that I don't mind wasting my calories, or my time on. However, a lot of candy books become some of my favorite books just because they are so much fun. 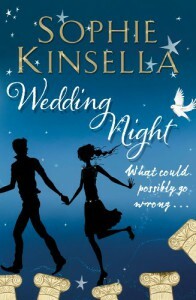 Wedding Night was so exception, an amazing candy book that was just a fun read. It followed the formula of other Kinsella books, written in the exact same voice of all her other books, but this time told from the point of view of several different characters.